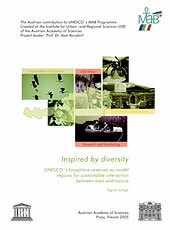 In the UNESCO biosphere reserves of the world, life unfolds in all its diversity. Since the 1992 World Summit in Rio de Janeiro, the guiding principle for environmentalism throughout the world has been the setting of abstract concepts of sustainability into practice. The ambitious goal is to bring the three aspects – nature conservation, scientific research, and environmental monitoring and education – into harmony with sustainable regional development. Human livelihoods are expressly included in the concept of the future-oriented reserves. Prototypical areas have been defined that link human populations with nature. Under the motto “a life worth living and effective management”, UNESCO directives have created new opportunities for populations in areas with poor infrastructures. There are currently five biosphere reserves in Austria (Lobau, Neusiedler See, Gurgler Kamm, Gossenköllesee and the Große Walsertal), and it is planned to add the Vienna Woods to the world-wide UNESCO net. Currently there is a veritable boom: the feasibility of the creation of biosphere reserves has been examined in many parts of Austria, including the March-Thaya region, in Pongau/Lungau, in the Wachau, and in the states of Styria (Koralm) and Carinthia (Nockberge). The brochure provides an overview of the development of the MAB (man and biosphere) program from the early 1970s to today. The individual biosphere parks are presented in detail. A list of exemplary parks, focussing on research, education and regional development, rounds out the picture.